The Greeks called amber elektron, or “made by the sun.” Homer praised its bright glow. The Egyptians buried it in tombs for the afterlife. Today’s scientists value amber too: it provides a three-dimensional window into prehistoric ecosystems through the myriad animal and plant inclusions it contains. 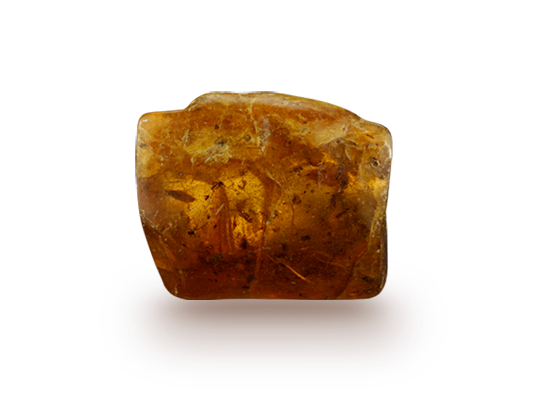 While amber isn’t a birthstone, it is associated with the astrological sign of Taurus. 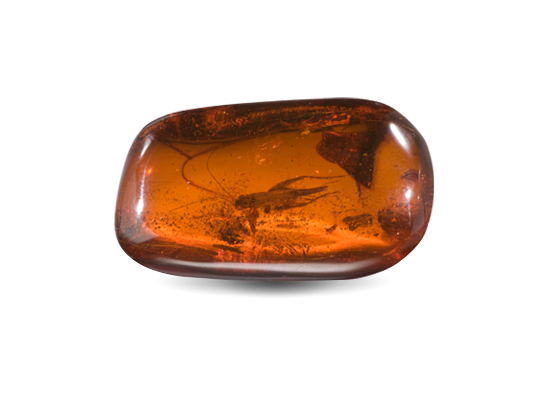 The oldest amber dates to the Upper Carboniferous Period (approximately 320 million years ago). The Amber Room, a 1716 gift presented to Russia’s Peter the Great, was made from six tons of amber. 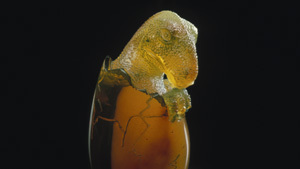 1,000 extinct animal species as well as various types of plant matter have been identified in amber. 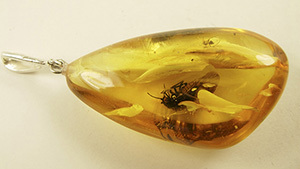 With inclusions like insects, lizards, leaves, flowers, and feathers, amber helps scientists study ancient ecosystems. Although the movie Jurassic Park is fiction, scientists extracted DNA from insects enclosed in 120-million year old amber. Amber smells good when you rub it. Although an oil made from burned amber was used in scents in ancient times, it isn’t used in perfume today. Assessment of the following characteristics determines amber’s value. Amber comes in more colors than “amber.” Rare pieces can even be blue or green. 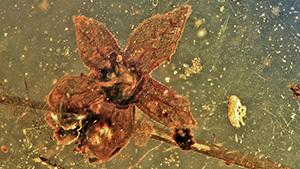 Amber with insect or plant inclusions is much more valuable than amber with none. Most amber is polished in free-form shapes, cabochons or beads. Amber is surprisingly light: in fact, it will float in a saturated salt solution.